43. Delmelle E.M., Marsh D., Dony C. and P. Delamater. Travel Impedance Agreement among Online Road Network Data Providers. International Journal of Geographical Information Science. To appear. 42. Whiteman Ari, Eric Delmelle, Tyler Rapp, Shi Chen, Gang Chen, Michael Dulin (2018). A novel sampling method to measure socioeconomic drivers of Aedes albopictus distribution in Mecklenburg County, North Carolina. International Journal of Environmental Research and Public Health. In Press. 41. Major E.; Delmelle E. C. and E.M. Delmelle (2018). SNAPScapes: Using Geodemographic Segmentation to Classify the Food Access Landscape. Urban Science. In Press. 37. Racine E., Delmelle E, Major E and C. Solomon (2018) Accessibility Landscapes of SNAP-Authorized Stores. Journal of the Academy of Nutrition and Dietetics. In Press. 36. Delmelle E., Deshardins M.R. and J. Deng (2017). Designing spatially cohesive nature reserves with backup coverage. International Journal of Geographical Information Science. 35. Kirby R., Delmelle E. and J. Eberth (2017). Advances in spatial epidemiology and geographic information systems. Annals of Epidemiology, vol. 27: 1-9. 30. Radcliff E., Delmelle E., Kirby R., Laditka S., Correia J. and C.H. Cassell (2016). Factors associated with travel time and distance to access hospital care among children with spina bifida. Maternal and Child Health Journal, vol. 20(1): 205-217. 29. Hohl, A.; Delmelle E.M. and W. Tang (2015). Spatiotemporal domain decomposition for massive parallel computation of space-time kernel density. ISPRS Annals of the Photogrammetry, Remote Sensing and Spatial Information Sciences 2.4: 7[PDF]. 25. Delmelle, E.M.; Zhu H., Casas I. and W. Tang (2014). A Web-based geospatial toolkit for the monitoring of Dengue Fever. Applied Geography, vol. 52: 144-152 [Working Paper]. 20. Kienberger S., Hagenlocher M., Delmelle E.M. and I. Casas (2013). A Web-GIS tool for visualizing and exploring socioeconomic vulnerability to Dengue Fever in Cali, Colombia, Geospatial Health, vol. 8(1): 313-316 [pdf]. 15. Delmelle E.M., S. Li and A. Murray (2012). Identifying Bus Stop Redundancy: A GIS-based Spatial Optimization Approach. Computers, Environment and Urban Systems, vol. 35: 445-455. Modeling of AEDs as Emergency Medical Devices in a 3D Indoor Environment. International Journal of Geographical Information Science, vol. 26: 469-494.
and Policy, vol. 4: 113-137 [pdf]. conifer forest. Remote Sensing of the Environment, vol. 115: 3625-3639. 9. Akella M., Delmelle E.M., Batta R., Rogerson P. and A. Blatt (2010). Optimal Adaptive Facility Location Using Geostatistics. Geographical Analysis, vol. 42: 227-244. 8. Casas I., Delmelle E.M. and A. Varela (2010). A space-time approach to diffusion of health service provision information, International Regional Science Review, vol. 33: 134-156. Non- Stationary Spatial Variables. Geoderma, vol. 153: 205-216. 6. Casas I., Malik A., Delmelle E.M., Karwan M.H. and R. Batta (2007). An Automated Network Generation Procedure for Routing of Unmanned Aerial Vehicles(UAVs) in a GIS Environment. Networks and Spatial Economics, vol. 7: 153-176. Landscape Genetics. Heridity, vol. 98: 128-142. 4. Delmelle E.M., Rogerson P., Akella M., Batta R., Blatt A. and G. Wilson (2005). Spatial Considerations in Evaluating the Effectiveness of Mayday Devices. 3. Akella M., Batta R., Delmelle E.M., Rogerson P., Blatt A. and G. Wilson (2005). Emergency Coverage Requirements. European Journal of Operations Research. 2. Rogerson P., Delmelle E.M., Batta R., Akella M., Blatt A. and G. Wilson (2004). Optimal Sampling Design for Variables with Varying Spatial Importance. Geographical Analysis, vol. 36: 177-194. 1. Akella M., Bang C., Beutner R., Delmelle E.M., Wilson G., Blatt A., Batta R.
Notification (ACN) Systems. Accident Analysis and Prevention, vol. 35: 349-360. 16. Martin M. and E.M. Delmelle. Modeling Spatial Attractiveness to Wine Tourism in North Carolina, U.S.A. In: Özge Öner, Mauro Ferrante, and Oliver Fritz (Eds). Regional Science Perspective on Tourism and Hospitality. Springer. 15. Chen M., J.-C. Thill and E. Delmelle (2018). iGLASS: An Open Source SDSS for Public School Location-Allocation. In: J.-C. Thill and S. Dragicevic. Geocomputational Analysis and Modeling of Regional Systems. SpringerLink: 325-353. 14. Hohl, Alexander, Minrui Zheng, Wenwu Tang, Eric Delmelle, and Irene Casas (2017). Spatiotemporal Point Pattern Analysis Using Ripley’s K Function. In Geospatial Data Science Techniques and Applications, CRC Press. 13. Delmelle, E., Tang, W., Zheng, M., Lan, Y., & Owusu, C. (2017). Geocoding Fundamentals and Associated Challenges. In Geospatial Data Science Techniques and Applications (pp. 57-78). CRC Press. 10. Delmelle E.M. and P. Kanaroglou. Introduction: Spatial Analysis and Health. 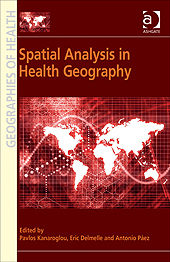 In: Spatial Analysis in Health Geography, with Pavlos Kanaroglou, Eric Delmelle and Antonio Paez (Eds.) [PDF].